Yes, you can skip the harsh cleaners and still get your kitchen sink sparkling. It's a fact of life: you need to know how to clean a stainless steel kitchen sink, because yours is going to get dirty. Especially if you cook often (or do a lot of DIY projects involving messy paint and glue), your sink is likely coated in a layer of collected grime. And like most cleaning projects, the longer you let it linger, the more difficult the task becomes. 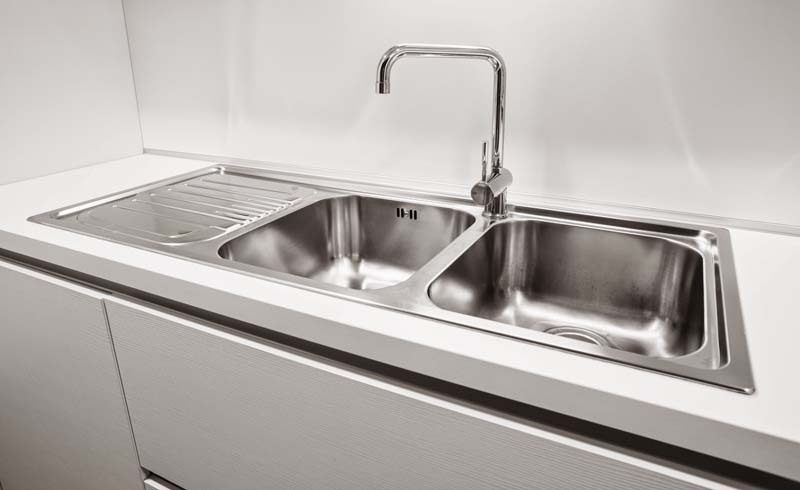 To keep your sink sparkling, the first step is to learn how to clean your stainless steel sink using basic supplies you likely already have on hand, and then setting a goal to give your sink a regular scrubdown about once a month. When you ditch the harsh chemical cleaners (and the trip to the store), this unpopular cleaning task becomes much more tolerable. 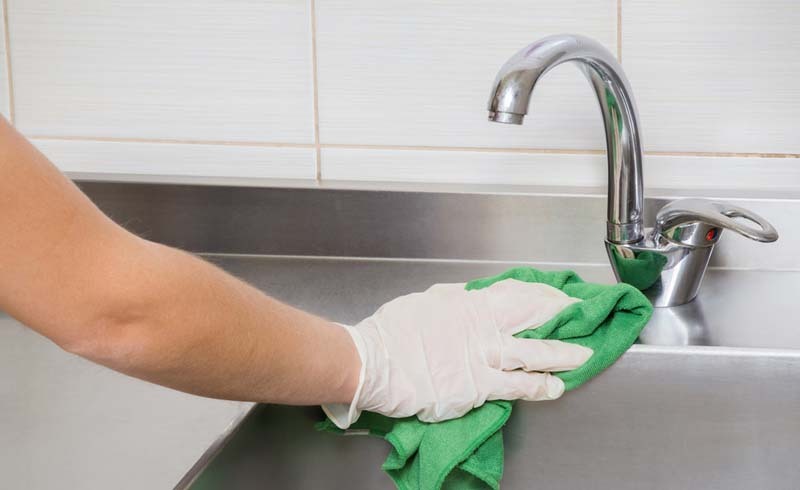 Add in the cleaning power of elbow grease, and who knows, vigorously scrubbing your kitchen sink could become the most therapeutic thing you do all week. Start by removing any food scraps from the basin and clean out the drain. Rinse down the basin, using your sink's spray hose if it has one. Sprinkle baking soda liberally over the entire surface of your sink so it's coated in a thin layer. Be sure to cover the walls of the sink as well. Using a soft sponge or cloth, start to buff the sink with the baking soda, working in the direction of the grain of the stainless steel. The baking soda acts as a mildly abrasive scrubbing agent that won't scratch delicate stainless steel. If you have a lemon on hand, slice it in half. Squeeze one half of the lemon over the baking soda. Then, using the other lemon half, rub the cut side over the baking soda, following the same circular buffing motion as above. The lemon will help deodorize the sink, while the baking soda polishes the stainless steel surface. When you're done scrubbing (and have released all of your feelings into cleaning), pour white vinegar over the baking soda, which will create a chemical reaction with lots of fizzing. Don't worry, the fizzing means cleaning is happening! Pour just enough white vinegar to dissolve the baking soda, so there's no risk of it clogging your drain on the way down. Rinse the sink thoroughly. You can stop here, but if you really want to make your sink shine (and impress your guests), dry the stainless steel, then pour a small drop of olive oil onto a cloth or paper towel and rub the stainless steel, again working in the direction of the grain. Wipe off any excess oil and admire your beautiful, gleaming kitchen sink.